Mini audio systems are all about improving your lifestyle. Beyond merely saving space, though, the right mini system adds functionality and style in an integrated package. The CS-325 CD receiver system takes things a step further, thanks to its exceptional ability to reproduce audio. 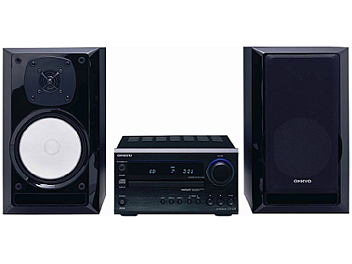 Here, Onkyo has applied the same approach used in its acclaimed two-channel audio line-up. The end result is a system best described with one word-musical. The system's multi-format-capable receiver sports a robust chassis designed to suppress vibrations. Meanwhile, the accompanying speakers feature a gloss finish on the front, as well as proprietary Onkyo speaker developments designed to deliver audio signals with punch, clarity and emotion. * Discs that have not been properly finalized may only be partially playable or not playable at all.